” Animals From Farm To Slaughterhouse Adverts contribute towards site running costs, but currently may not fit with the site ethos. We will continue to work on a solution. Why Is Egg Production Cruel? 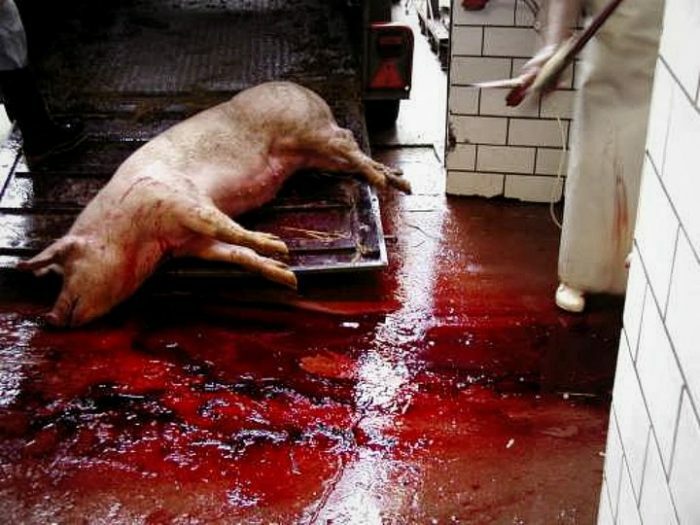 What Happens in Slaughter Houses? How Do We Know Animals Suffer Like Humans? The horrors that go on in the slaughter house are something the meat industry do not want you to know. The meat industry likes to portray happy farm animals, but how could any animal feel anything but terror and pain when faced with the suffering of factory farming and the slaughter process? 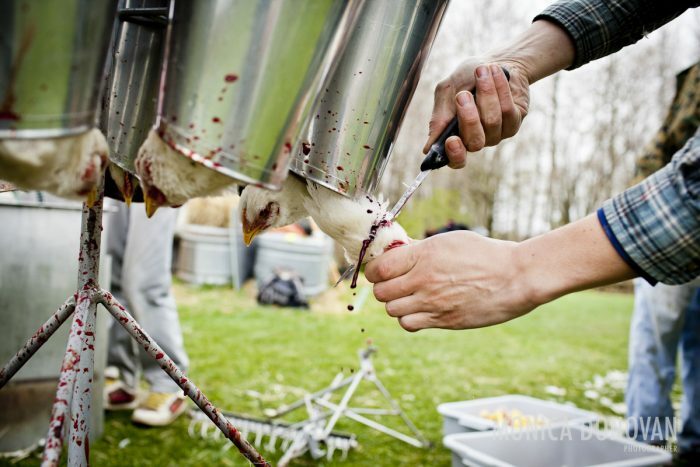 Beating, boiling and dismembering animals alive is common-place in today’s slaughter houses. You may think “that wouldn’t happen in my country”, but it happens in every country, including the USA, UK, Australia, New Zealand, all over Europe, and other places. Although some these countries have procedures that are supposed to prevent such things happening, under cover investigations by animal rights and welfare groups, and even investigations by official Government bodies have found it to be the case for up to 40% of animals. Other countries so not even have that level of “welfare”. Human demand for meat has led to quicker production demands, which means the meat industry’s production line stops for nothing, especially sick, disabled and not effectively stunned animals. This ordeal is happening RIGHT NOW, EVERY SECOND to innocent animals, and is funded by each person who buys meat. See what buying meat pays for. Of course there is also a lot of cruelty involved in animal agriculture even before the animals reach the slaughter house. Read on to learn more about the dairy and egg industries, live export, the slaughter house, and more..
Misery for the animals often starts long before the slaughter process begins, and even before the transportation to the slaughter house. 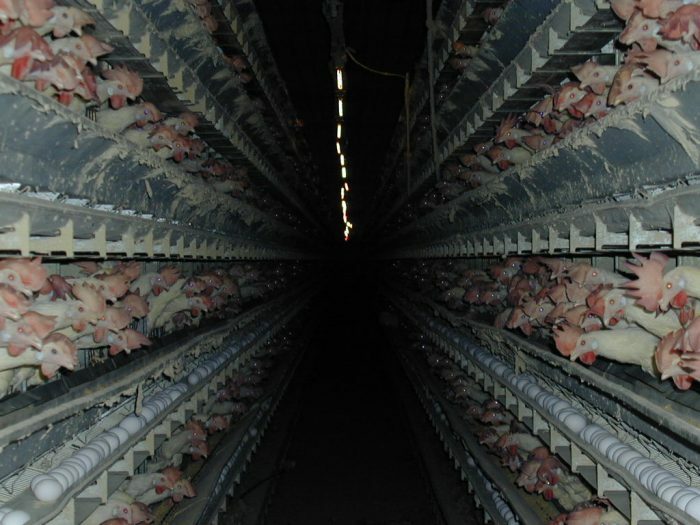 Factory farming involves animals stored in cramped, hot, disease ridden cages, crates or other confined spaces to produce eggs or other food for humans to consume. There are an estimated 16 million battery hens in the UK alone! As soon as they are born, chickens in the egg industry are sexed and accepted, or rejected. 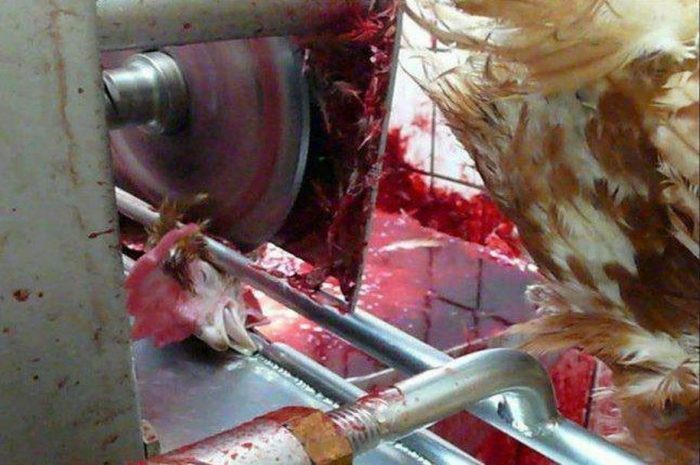 The rejected chicks are disposed off by either being suffocated, or being ground up alive in a grinding machine. 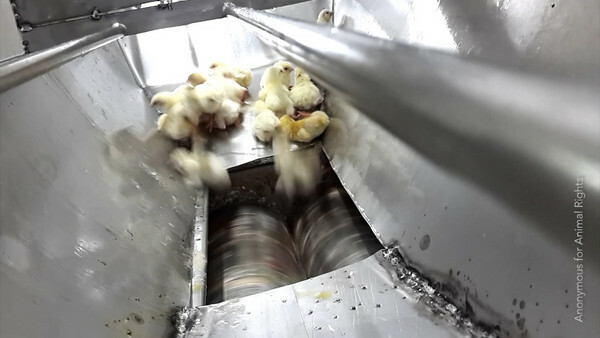 Image: A rejected chick is just about to fall off the conveyor belt in to a grinding machine that will grind him up alive. Calves of dairy cows, forcibly impregnated so they keep producing milk, become victims of the slaughter house. Animals on Farms and Ranches often don’t get the veterinary help they need because it costs too much and the farmers and ranch owners do not want to cut in to their profits. Many animals are known to have died of dehydration, have frozen to death, or suffered other horrible deaths due to inadequate care. Cows are often branded so farmers and ranchers can identify their cattle. This method is agonising for the animal, just as it would be for a human. Cows that are ‘Downed’ – a term used by cattle ranchers for cows that are so traumatised, exhausted or injured that they cannot stand, are often beaten to force them up again, and dragged to slaughter. This of course causes them even more pain. See more about factory farms, Here. In order to produce milk, dairy cows must be pregnant, so they are forcefully artificially inseminated over and over again. After they are born, the baby calves are taken from their mother each time. Humans want to steal the mothers milk so cannot let the calves have it. The calves are considered simply a by-product of milk production, and are normally killed. This happens repeatedly throughout the mother cows life. When separated the mother and calf pine for each other, suffering prolonged periods of this distress. Once the mothers are no longer producing enough milk to be profitable to keep, they too are killed, at a fraction of their natural lifespan. For more details, read this and watch the video below. There is no need to fund this cruelty when so many other milk alternatives are available. 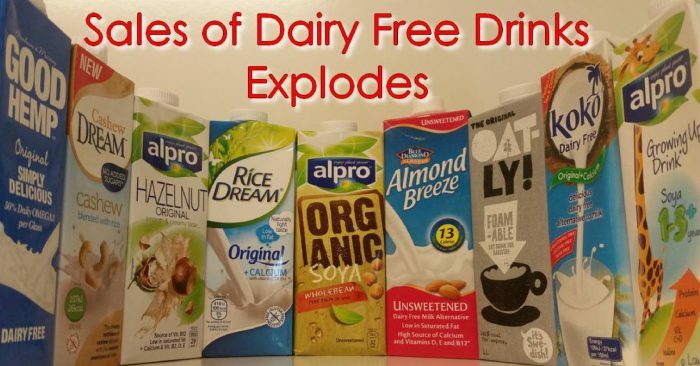 My personal favourites are Alpro Cashew milk (Also known as Provamel) and Rice Dreams rice milk. The Alpro Cashew milk tastes the most like cows milk out of the many milk alternatives I’ve tried, but the Rice Dreams one is tasty too. It reminds me a bit of rice pudding. It is worth shopping around to get the lowest price. Have a look at the Vegan and Vegetarian Diet page to see how easy it is to avoid funding this cruelty. The egg industry kills millions of one day old male baby chicks every year, by either grinding them up ALIVE in a macerating machine, suffocating them, gassing them, or crushing them under each other’s weight and letting them die of starvation and exposure. People think these things are so cruel that they would not be legal in their country, but they usually are, even in countries with relatively high animal welfare standards. The male chicks are no use to the egg laying industry so are disposed of in these ways. 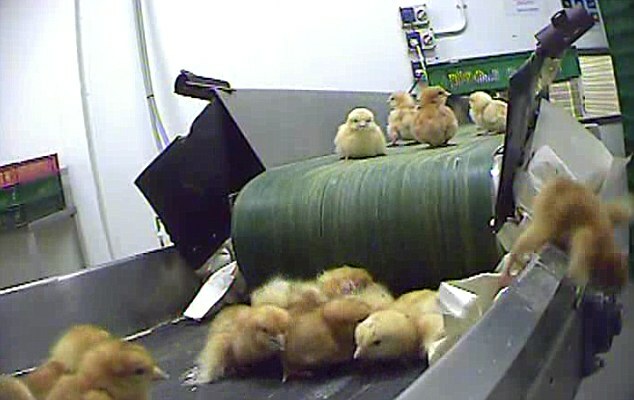 The remaining female chicks are often subjected to a life of misery in cages or in filthy and crowded barns. The end of their lives is more horrific than anything when they are sent to the slaughter house when they are no longer profitable to keep. To find out how easy it is to stop funding this cruelty, see the Vegan and Vegetarian Diet page. In some countries, when an outbreak of disease occurs among farm animals, animals are buried ALIVE. Both diseased animals, and animals that are thought may be at risk of having the disease, are pushed into a mass grave lined with plastic, with some being painfully injured as they fall in. 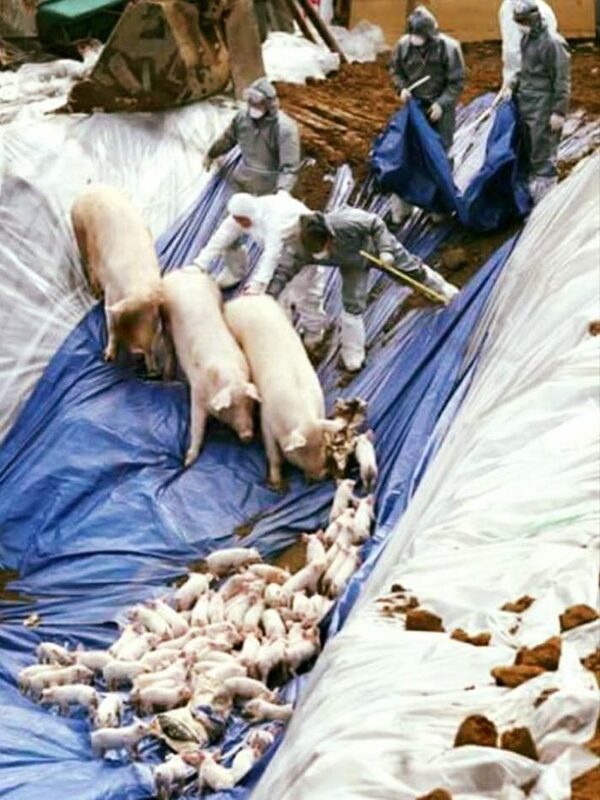 They are then covered in plastic and the ground filled in, leaving the animals trapped, terrified, and suffering an unimaginably cruel and lingering death. This happens every single time there is a disease outbreak, so it happens regularly to huge numbers of animals. It is done this way because it is the cheapest option. You may be relieved if this does not go on in your country, but it happens in many countries that export meat to other countries. That means that people in other countries who are funding the meat industry could be funding this cruelty. I have just taken part in an email campaign on Facebook, which you can also take part in, here. 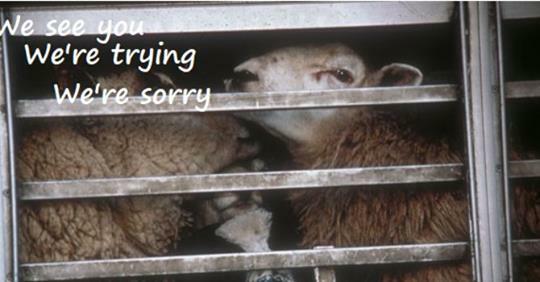 Every year hundreds of millions of animals all over the world are exported live from their country of origin to be slaughtered, or fattened and then slaughtered. They are often exported to countries where the animal welfare standards are a lot lower than the country of origin, or none existent. The country of origin has no control over how the animals are treated once they are exported. The animals exported to be slaughtered are not just farm animals such as pigs, cows and sheep. For instance, a huge number of horses are included. The experience of being exported itself causes a lot of suffering to the animals involved. The journeys can be extremely long, sometimes days, sometimes weeks. When travelling in sub-zero temperatures, the animals have no heat and often suffer frost bite and other cold related conditions, with some dying. In very hot conditions, they are not cooled down at all. they dehydrate and overheat, with some dying. They are often deprived of food, and even water – even in hot conditions. 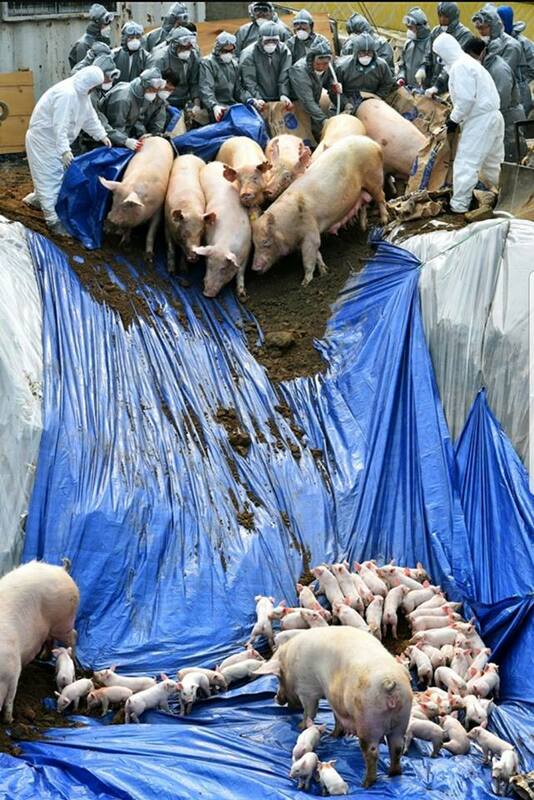 They are transported in overcrowded conditions and often injure each other, slipping in the excrement they are standing in. Animals who fall can be slowly crushed to death under the feet of others. Frightened animals can fight back when caused pain, and other animals can become ill. 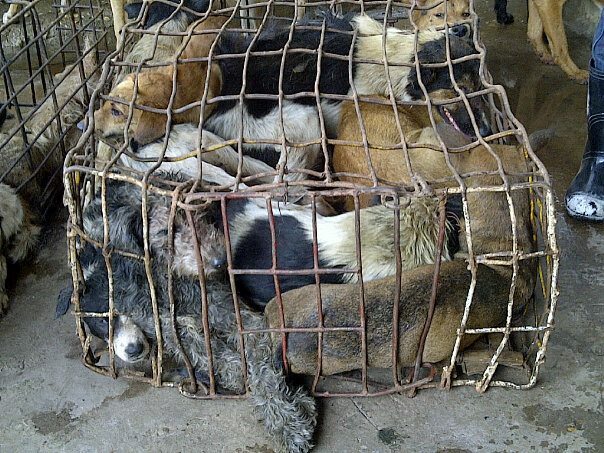 They suffer terrible pain in these cases, which they are not given veterinary attention for. They are often beaten to try to control them. The whole experience is extremely stressful for animals and causes them immense distress and fear. Many people think that this would not be allowed in their country, but it usually is. Millions of live animals are exported from Australia, the USA, the UK, and other countries each year in such conditions. They suffer gruelling journeys, that take days, even weeks in often overcrowded conditions. During the journey they can become ill or injured, suffer stress, fear and pain. They often slip, slide and fall, arriving covered in excrement. terrified animals can fight back and may be maimed, blinded or hoisted to the ceiling by their legs. All may be beaten or kicked. Animals shipped to the EU may continue to countries outside the EU, where they are not protected by EU law. Animals have been recorded by investigators and journalists as being without food and water for long periods, sometimes dying on the journey and arriving at their destination filthy, injured or standing on the carcasses of animals that have died. Even worse than the suffering on their journey can be what happens to them when they arrive at their destination. Deliberately injured, tendons in their legs cut to restrict movement when handling. Hoisted to the ceiling by one rear leg when fully conscious and slaughtered. Restrained and then beaten with a sledgehammer. This is all to try to make controlling the animals easier and is all done while these sensitive animals are absolutely terrified. You can see examples of slaughter practices outside the EU here and here. Slaughter practices in Turkey, the Middle East and North Africa are incredibly cruel. They are in breach of the international standards on welfare at slaughter of the OIE (World Organisation for Animal Health). In addition to this, Article 13 of the Treaty on the Functioning of the EU provides that the EU and the Member States must “pay full regard to the welfare requirements of animals”. We feel that sending animals to countries in which they will be slaughtered in ways that are cruel and in breach of international standards on animal welfare does not do this. The EU argue that this only applies while the animals are in the EU. Most countries are guilty of doing this. Despite all this, this cruelty continues. Here is where you can take action by signing a petition. Even within their own country, the journey to slaughter can involve very long journeys and a huge amount of suffering to animals. You and your friends are unexpectedly forced, by being beaten by an impatient worker, in to a truck. You don’t know what is happening and are confused and frightened. You are very hot and have had no water to quench your terrible thirst on this long journey. You see others dying of thirst and starvation on the way. Finally, the lorry stops. You hope you will be given a drink, but instead you and your friends are forced in to a building. The unfamiliar and disturbing sights and smells terrify you and your friends. You are all trapped. You are forced forward by someone poking you with a stick that gives you horrible electric shocks. You panic as you see a person hold a bolt gun to your friends head. In horror you see you friend fall. It could be said that the ones that are stunned effectively are the lucky ones in the slaughter house, considering around 40% are not and feel every moment of the agonising torture. 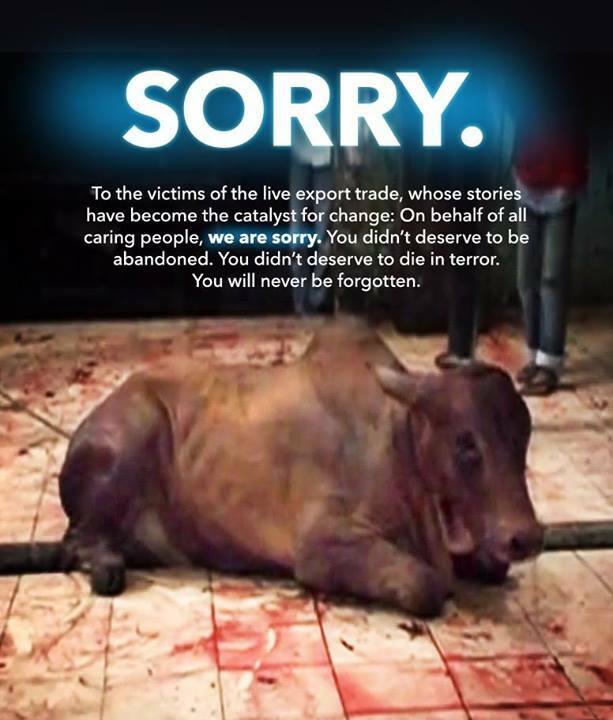 Live Export conditions are horrific. As in all areas of farming and the meat industry, animals are seen as commodities, or money, rather than living, breathing fellow animals. The abuse continues every day. Even in Countries such as the USA and the UK, Companies break laws all the time with regards to how animals should be treated. 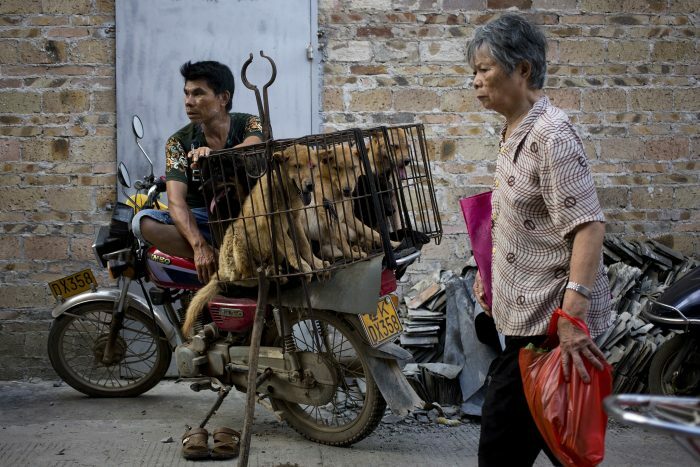 In Asian countries such as China, Korea, Thailand and Philippines, the cruel Dog Meat trade claims many victims. Animals that are not stunned correctly are butchered when they are fully conscious. Please take a moment to review the book Slaughter House and learn the truth about slaughter houses that the meat industry do not want people to know. Top vets condemn the high number of animals being slaughtered without any attempt being made to stun them first. Halal meat (for Muslims) and Kosher meat requires that the animal is not stunned first. Video: Slaughtering machine typically used in Kosher slaughter houses, where stunning is not used and the animal is fully conscious and terrified when it’s throat is slit. 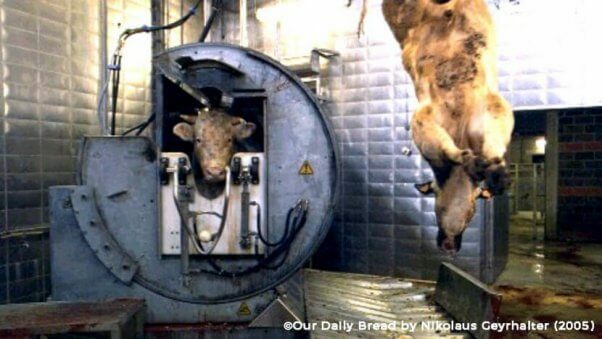 The animal is forced in to the machine by people giving it shocks with an electric prod, then it’s throat is slit. 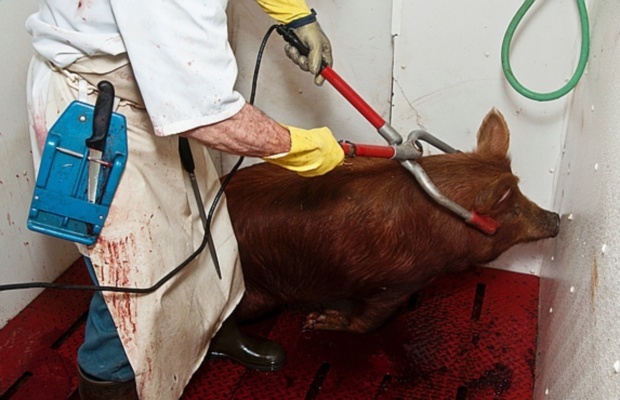 Nearly all of the animals attempt to stand up and after their throats are slit. Animals slaughtered to provide Halal meat is also done without stunning. Muslims believe that as long as the knife is sharp and the slaughter can be done in one go, it is the kindest way and acceptable. I wonder if they would think the same if they themselves were faced with this death? A huge number of animals are killed this way and top vets, such as Professor Bill Reilly (past President of The British Veterinary Association), suspect that even when the meat does not have to be halal or kosher, animals are still not stunned, simply so the slaughter house can save money. Even when attempts to stun animals is made, by firing a bolt gun in to their head, or electrocuting them, around 40% of the time the stunning is ineffective. This means the animals feel every agonising moment. This is happening every minute of every day because people who buy meat are paying for it to happen. Because slaughter house slaughter of farm animals is legal, it is not considered animal abuse in the eyes of the law. There are countless documented cases of other behaviour that IS considered to be animal abuse in slaughter houses. This is where the workers willfully cause the animals more suffering than is legal. Many of these cases are not reported and go undocumented. In 2011, Abattoir Staff at a Slaughter house in Essex, UK, run by a Cheale Meats, where up to 6000 pigs are killed every week, were seen striking the pigs with paddles and stubbing out cigarettes in their faces. 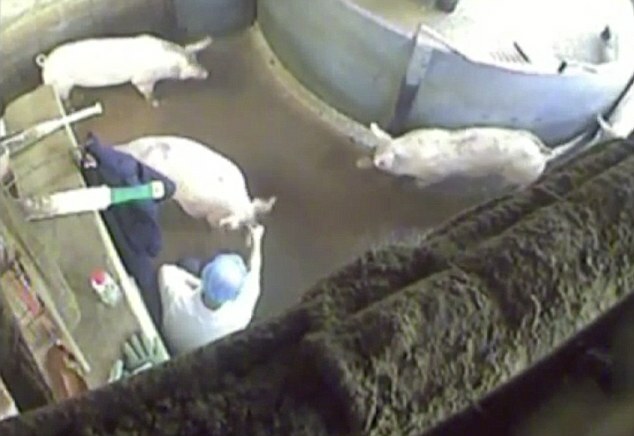 Another worker punched a pig in the face, and others were filmed kicking them. 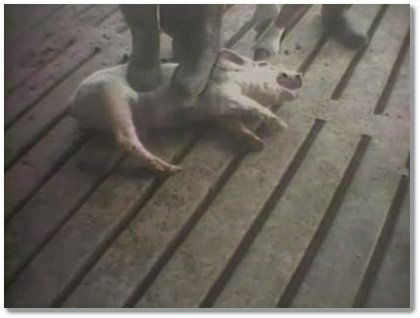 Often the pigs were not stunned correctly, leaving them in screaming agony as they bleed to death. Unbelievably though, the Food Standards Agency in the UK refuse to prosecute those involved. In other cases such as this, pigs are repeatedly electrocuted with iron prods, by laughing workers. The people who do that kind of job lack compassion for animals, otherwise they could not do it. Their actions demonstrate their lack of respect and empathy for animals. The uproar was appalling, perilous to the ear-drums. There were wails of agony; there would come a momentary lull, and then a fresh outburst, louder than ever, surging up to a deafening climax. It was too much for some of the visitors and the tears started in their eyes. Meantime, the men upon the floor were going about their work. Neither squeals of hogs nor tears of visitors made any difference to them; one by one they hooked up the hogs, and one by one slit their throats. There was a long line of hogs, with squeals and life-blood ebbing away, until each vanished into a huge vat of boiling water. The hogs were so innocent, they came so very trustingly, they were so very human in their protests. They had done nothing to deserve it. Australian Cattle have been subjected to the most horrific abuse in Idonesian abbatoirs, all in the name of the meat industry. Undercover footage for a programme called Four Corners Tonight on the Australian ABC1 Channel showed animals being kicked and beaten. Their throats were hacked at, their eyes gouged and their tails broken. Some of the cattle were conscious when they were dismembered. Iowa’s agricultural Industry are trying to make undercover filming of farm animal abuse illegal. This means people trying to protect farm animals from cruelty by filming abuse can be prosecuted! See details on the Teddy Hilton website. Such laws will only increase animal abuse and protect animal abusers. 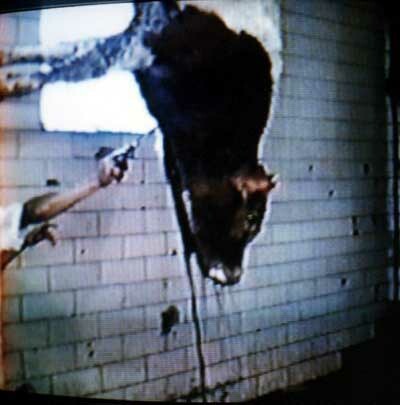 Filmed through an open window at the back of the Ryding-Regency slaughterhouse in Toronto, Canada, footage clearly shows a large brown cow thrashing about on the floor, trying to get up, as blood gushes out of a gaping wound on her neck. A black-and-white cow similarly struggles on the floor, while a worker bends over and cuts her throat. 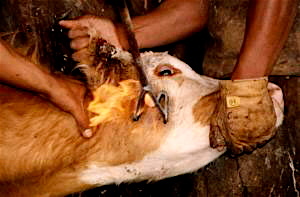 Cows hoisted upside down, dangling from one leg, appear to be still conscious with their eye lids opening and closing, while workers tear off the skin from their faces with knives. Blood is everywhere. It is illegal to hoist a conscious cow in Canada. Like other countries, slaughterhouse workers do not care about the laws, rules or the suffering of the animals. Anyone with any compassion for animals could not bear to work in a slaughter house, so the animals are left with people with no compassion, empathy or sympathy for them. These people think nothing of causing them horrific suffering, especially since time is money and the production line does not stop for anything as irrelevant as excessive animal suffering. There are countless videos of slaughterhouse activities on the web, which show that cruelty to this degree, to sentient animals, is sadly not an rarity. Nor is slaughter house workers’ disregard for animal welfare laws. This is the case in every country. To continue to fund the meat industry is to condone this treatment of animals, and, in fact, keep causing it. 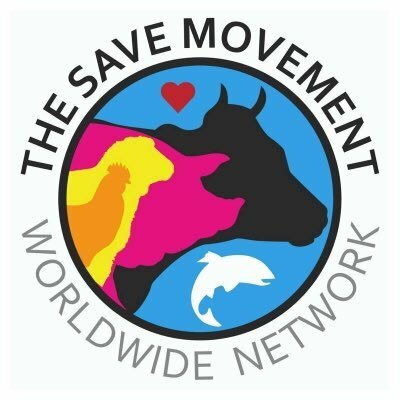 The Star Colomnist, reports here on her experience of bearing witness with the Save Movement, a group dedicated to offering animals a moment of comfort before they enter the slaughter house, and raising awareness of their plight. Illegal slaughter houses are used by the illegal meat trade. The illegal bush meat trade is the is the horrific treatment of both endangered and companion animals. 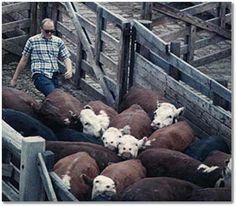 Illegal slaughter houses can also slaughter farm animals and are active in all countries, including the US and UK. 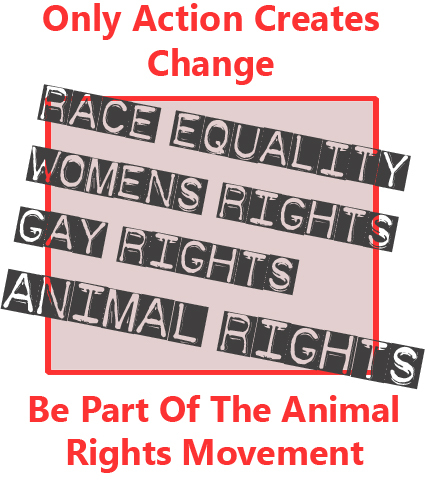 The animals are slaughtered in unsanitary conditions and are not fit for human consumption. This meat then goes on sale to the general public and can be extremely damaging to the health of unsuspecting consumers, or even fatal, as it has been in some cases. It is scary to think that the meat trade is booming when modern science proves not eating meat or other animal produce such as dairy, is a much healthier and less risky way to live. As far back as 1961, the Journal of the American Medical Association reported that a vegetarian diet could prevent 90-97% of heart diseases. There is also a strong link between consumption of meat and bowel cancer. Scotland in the UK eats a large amount of meat, much of it processed`, and it has the highest rate of bowel cancer in the world. The kidneys of the meat-eater has to work three times harder than the kidneys of the vegetarian, putting more pressure on that organ. In addition, when people think they are eating one type of meat, it can actually be a different type of meat that is cheaper to produce. 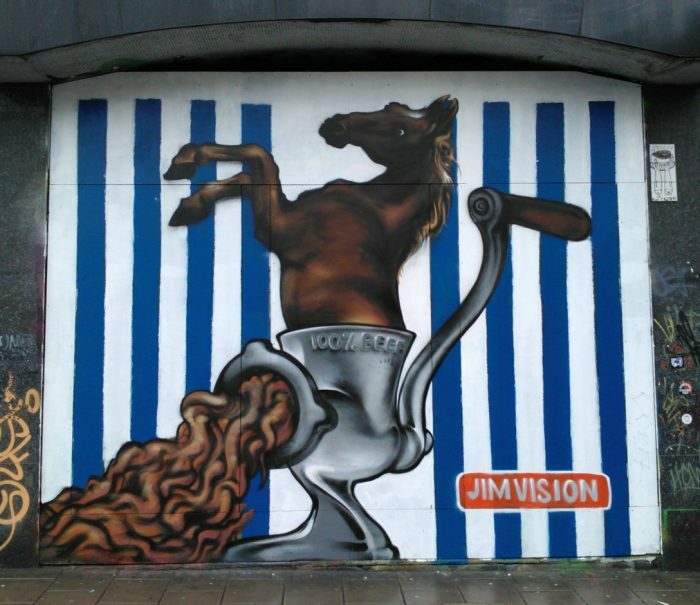 This was discovered during the UK’s horse meat scandal. This as where horse meat was being labelled as beef and sold to millions of unsuspecting customers through well known and trusted retailers all over the UK. The retailers were oblivious to what was happening. Furthermore, meat truck drivers have told of how, when meat is rejected by one retailer because of its sub-standard condition when delivered, it is simply offered to another retailer, and another, until it is accepted. There, it is packed and sold to the public. The drivers also revealed that the meat is often unlabelled and not identifiable as one particular type of meat, and it’s packaging is so poor that it is exposed to a whole host of dangerous germs and contamination. 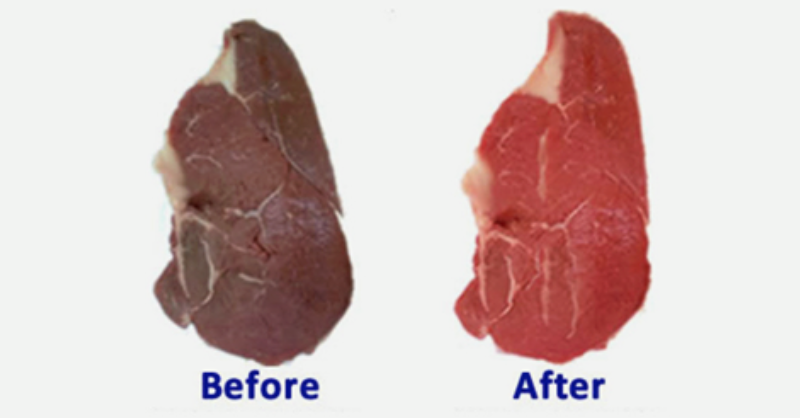 Records from investigations show meat packers often marinate rotten meat to disguise the smell. A 2011 study published in the journal Clinical Infectious Diseases found that half of the U.S. supermarket meat sampled contained staph infection bacteria, including the hard-to-kill MRSA. Turkey products were most likely to harbor staph bacteria, followed by pork and chicken products. MRSA kills more people than AIDS. Beef burgers can contain bacteria from 1000 different cows. Lazy employees leave hair, ear canal debris, and teeth in products. Chicken and ham are soaked in chlorine baths to remove odour, and red dye is added to beef to make it appear fresh when it is not. Another method used is carbon monoxide treatment. This toxic practice makes seriously decayed meat look fresh for weeks. Contaminated meats from slaughter houses, legal or illegal, and from the illegal Bush Meat industry, can be dangerous. All meat is contaminated before being cooked, and if not cooked properly, remains contaminated. This contamination can lead to devastating health problems for humans. Fact: American animals raised for meat eat more than 30 million pounds of antibiotics a year, even though they are perfectly healthy. Most supermarket meat today comes from operations that routinely feed animals antibiotics. This creates dangerous strains of hard-to-kill superbugs. It is thought that the consumption animal produce is a main reason that humans are becoming so resistant to anti-biotics. Food animals raised in North Carolina alone ingest more antibiotics each year than the entire American public. Antibiotics are needed because the animals treatment and their filthy, confined conditions stress them to the point where their immune systems are depleted. 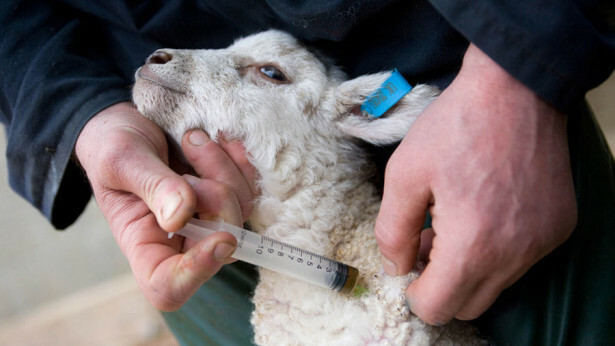 The drugs are given to farm animals to help speed their growth, as stress slows their growth. This all means that when the animals actually need them when they are ill, they are resistant. This is also the case with humans who consume the drugged meat. Fact: Prozac may have been part of your chicken’s diet. In 2012, Johns Hopkins University study studied the feathers of imported chickens to figure out what the birds ingested before slaughter. They found traces of antidepressants, painkillers, banned antibiotics, and allergy medication. According to scientists, Prozac is sometimes used to offset anxiety common in factory farm conditions. (Stress can slow birds’ growth, hurting profits.) Scientists also uncovered caffeine in about 50 percent of samples taken. Why? Caffeine keeps chickens awake so they can grow faster. Ivermectin, an animal wormer that can cause neurological damage in humans. Flunixin, a veterinary drug that can cause kidney damage, stomach, and colon ulcers, as well as blood in the stool of humans. Penicillin, a drug that can cause life-threatening reactions in people who are allergic to it. Copper, that is harmful when too much accumulates in our bodies. Fact: The majority of beef is likely to harbor deadly E. coli germs. It’s natural for cows to eat grass, but not grains. Still, most cows today chomp down lots of grain to speed growth. This changes the natural chemistry in a cow’s gut, making it easier for potentially deadly E. coli O157:H7 strain to survive. World Starvation is also connected to meat production. 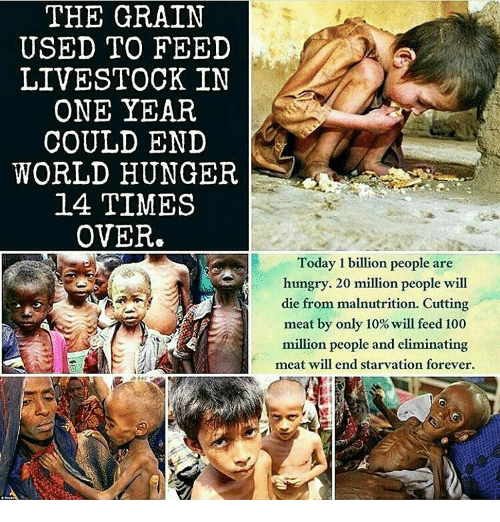 If the USA stopped feeding grain to cattle, Half a Billion people could be fed the excess grain – life saving food for nations such as Africa. Fact: All the antibiotics that are pumped into cattle, and other modern-day farming practices, lead to tough, chewy steaks, says Sarah Klein, a senior attorney in the food-safety program at Center for Science in the Public Interest. So, increasingly, slaughterhouses have adopted the process of mechanically tenderizing steaks and other high-quality cuts of beef. Doing so involves driving blades and needles into steak — which in turn, drive any bacteria living on the surface of a steak deep into the flesh. When you get an undercooked steak, for instance, if you like to order yours rare or medium, all that bacteria inside the meat is still alive, whereas before, it would have been seared off when the outside was cooked, she says. More than half of the 82 outbreaks linked to steak in the past ten years can be linked to E. coli, a bacterium that’s usually only found on the exterior of whole cuts of meat. high-quality cuts of beef. Doing so involves driving blades and needles into steak — which in turn, drive any bacteria living on the surface of a steak deep into the flesh. This is because all the antibiotics that are pumped into cattle, and other modern-day farming practices, lead to tough, chewy meat, says Sarah Klein, a senior attorney in the food-safety program at Center for Science in the Public Interest. When your meat is cooked, it has to be 75 degrees centigrade in the centre, otherwise all that bacteria that has been pushed in to the centre of the meat is still alive. More than half of the 82 outbreaks linked to steak in the past ten years can be definitively linked to E. coli. Meat packaging does not tell you whether the meat has been mechanically tenderised or not. Facts such as these are widely known, but people choose to ignore them, just as they ignore the horrific suffering that happens in slaughter houses and throughout the meat industry. People would never think it acceptable to put humans through the slaughter process, yet people support and fund putting animals through this every time they buy a meat containing product. Studies of farm animals’ physiology leaves us in no doubt that they feel pain just like humans, but animals and humans are also alike emotionally. Humans are, after all, just another species of animal. Research has shown that farm animals are happier and less anxious if they are with friends. The study found that when put on their own with animals they didn’t know, there was a rise in heart rate and cortisol – the chemical animals produce when they feel stress. The stress level of sheep rises sharply if they are separated from the herd, even by just a few feet. Studies also show Chickens are capable of displaying empathy when fellow chickens are stressed or in pain and grieve for ones that die. Although animals look different to humans, they have the same capacity to suffer pain and terror. Anything a human would suffer terribly by being put through, animals suffer the same. Some day humans will look back in shame and disgust at the sickening and disgraceful way today’s selfish humans treat innocent animals. There are lots of ways you can help stop cruelty to farmed animals. Most of the suggestions below will not cost you a thing. Do you have the conscience to change? You can stop eating animal products all together by adopting a vegan diet. However, to continue eating eggs, the only kind way is to EITHER adopt ex-battery hens and eating the eggs they lay, OR buy eggs from people who have adopted ex-battery hens and will let them naturally live out their lives. You will be letting them experience life how they should have always had it, rather than being slaughtered straight after their life of hell. If a change to veganism is too big a jump for you, many people first go vegetarian and then find the transition to full veganism much easier. People are funding the cruelty to cows through buying milk dairy products. Again adopt a vegan diet where you can find alternatives to cows milk & dairy products. Fight the farming community plan to make it illegal to film undercover inside farms. They are also planning to criminalise job seekers who get employment to expose their vile activities. See the Mother Jones website for more details. Animals Australia have a great site that explains how you can take action by changing your shopping and eating habits. Take a look at my cruelty free shopping page where you will find animal cruelty free companies you can deal with, that do not use animal products. If you would like to find organisations needing your action and support to fight against a specific type of cruelty, enter the type of cruelty you want to help stop (for example “farm animal cruelty”) into a search engine online, or search bar on social media. Do this through a fundraising search engine so you can raise money to help animals with every search.